This large park, home to the Balboa pool, includes a sand playground with climbing structures, four baseball fields, a soccer stadium, tennis courts, and a picnic area. The pool is indoors. The dimensions are 100 feet long x 40 feet wide, 4 to 10 feet deep. Water temperature is maintained at 80 degrees. Balboa Park/Pool is owned by the San Francisco Recreation and Parks Department. When the City gave Balboa Park over to the San Francisco Parks Commission in 1909, the first call on its budget was $100 for a band. The Ingleside Improvement Club wanted it for the dedication ceremony the following year. They got it and the park was oompahed in, October 19th, 1910. 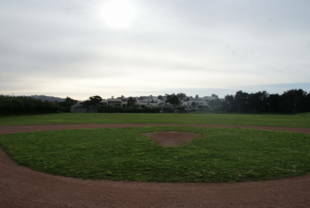 One Commission report that year noted that Balboa Park surrounded the House of Corrections and that progress was being made on a new ball field. 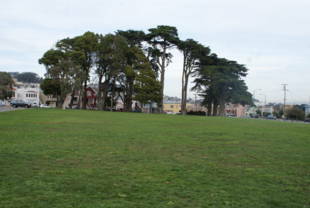 Two ball fields, and a successor to that House -- the Ingleside Police Station -- are fixtures in the 21-acre park today. But, beginning in the 1950s, changes and improvements came slowly and incrementally. In 1946, plans to build temporary housing in the park for returning veterans and their families got underway, and in 1948 141 two-and-four room apartments were ready for occupants. In 1951, the Board of Supervisors allocated $40,000 for a soccer field that required $110,000 more and Mayor Elmer Robinson approved paying it from the Recreation bond, noting that people had been working and fighting for it since 1907. In 1952 the Recreation and Park Department granted the New Mission Terrace Improvement Association $34,750 for replacing the Park irrigation system, completing two baseball diamonds, and lighting the tennis courts. 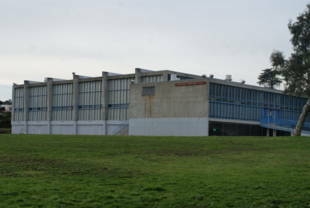 In 1994 a City College plan to acquire the Park for recreational and vocational opportunities for at-risk youth failed and it remained a park for all its neighborhoods. Located in the Outer Mission/Excelsior/Ingleside District, Balboa Park serves as a district, a neighborhood, and a public park. Its wide range of facilities includes two baseball and two softball fields, a soccer stadium, swimming pool with changing room, picnic area with tables and benches, tennis courts and a new playground. 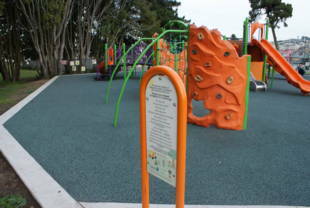 Built in the 1970s, the playground became dilapidated and dangerous after 38 years of heavy use in the area with the highest number of children in San Francisco. The Friends of Balboa Park Playground, a group of local residents, got together to replace it and provide a community gathering space. They raised money from their neighbors and local businesses, and, working with the Neighborhood Parks Council and Rec and Park, FOBPP received funding from the national nonprofit KaBOOM!, the American Academy of Orthopedic Surgeons and a $75,000 Community Challenge grant from the Mayor's Office for an ADA accessible pathway to the new playground. The total amount raised by the Friends was between $600,00- $700,000, according to John Katz, one of FOBPP's core group of movers and shakers. Rome wasn't built in a day, but on March 4, 2008, Balboa Playground was. With the old structure demolished by Rec and Park, over 475 adults and children converged on the Mission Terrace site for Playground Rebuild Day. At the end of the day it was Mission Accomplished: on the rubber surface are a tot lot and a larger play area with a rock-climbing wall; new orange, green and purple play structures; a play gym and a jungle gym with slides. Another improvement mission for the park is in development. The Trust for Public Land is taking on the renovation of Balboa Park, says its program manager Jacob Gilchrist. 'We are just beginning the community process and working with Rec and Park' he explains, adding that there is $900,000 in the FY08/09 city budget, but cannot predict what the total budget need will be. Marvin Yee, landscape architect at Rec and Park's Capital Improvement Division, expects to know more after members of his staff and TPL do a joint reconnaissance of the site. John Katz says Friends are proud and grateful for TPL's commitment and are looking forward to the neighborhood community outreach that they will be involved in. He enthusiastically notes, 'Without NPC and its staff, we wouldn't be what and where we are as an organization today, or be able to take advantage of this tremendous opportunity.' 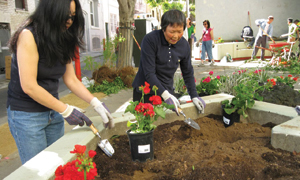 Balboa Park is ready for its makeover.